Wave City - A first of its kind project that truly personifies the concept of creating a city that thinks for you. Spread across 4500 acres, Wave City is one of India’s largest self-sufficient Hi-Tech City based on “Hi-Tech City Concept”. This Hi-Tech City offers smart features like Central Command Centre, Smart Meters, Intelligent Traffic Management, Waste Management, 24X7 CCTV surveillance, Weather substation, Water management, Complete Fiber Optic Connectivity and lot more . Master plan and designed by world renowned town planner and landscape designer – AECOM, Wave City features open spaces and contemporary designs. This project boasts of more than 750 acres of green spaces, wide roads and congestion-free BRT network for smooth traffic flow, health care provisions including hospitals, medical university, ISKCON Temple, educational institutions, local shopping centers, malls and multiplexes, etc. It is a city full of vigor and vitality, which makes it the perfect place to enjoy a comfortable, convenient and uncluttered lifestyle. 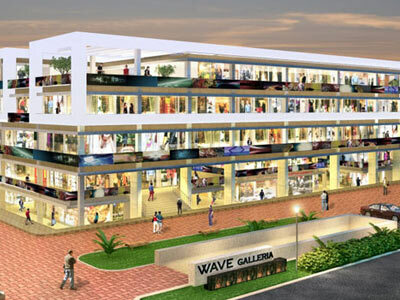 Wave Galleria is the first commercial complex launched in Wave City.